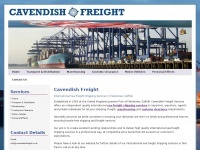 International Sea Freight Shipping Services from Cavendish Freight, one of the leading Shipping Companies in Felixstowe, Suffolk. The web server with the IP-address 54.246.209.119 used by Cavendishfreight.co.uk is owned by Amazon.com and is located in Dublin, Ireland. There are many websites run by this web server. The operator uses this server for many hosting clients. In total there are at least 491 websites on this server. The language of these websites is mostly english.